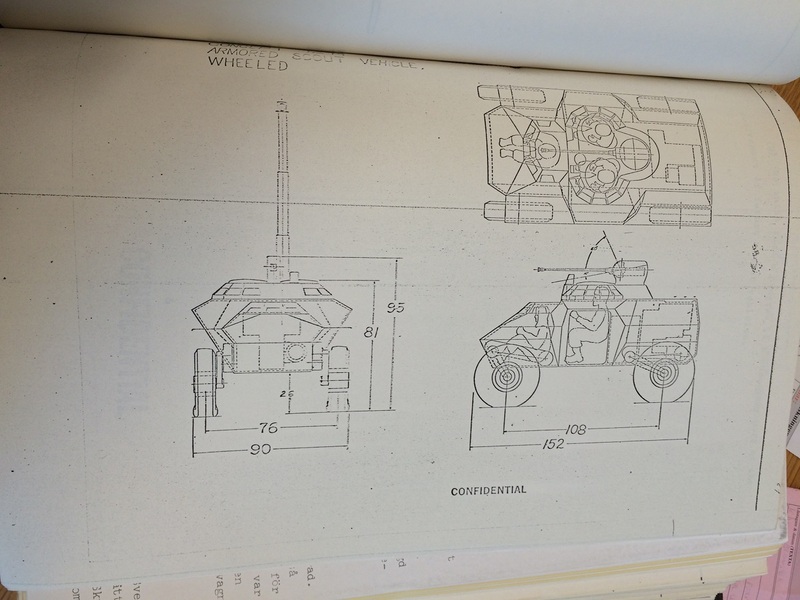 (C) This design study shows a wheeled version of an armored scout vehicle. 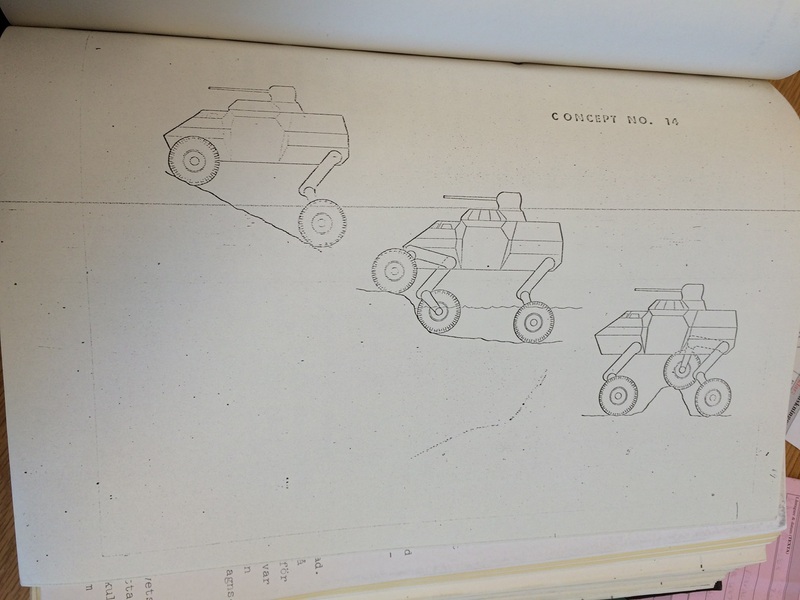 The intent of this design effort was to explore the feasibility of providing a wheeled vehicle of this type with good off road performance and soft soil mobility coupled with the almost indespensible capability to operate at high speed on highways and secondary roads. (C) The concept also features a three-man crew with all crew members having good vision. The commander and gunner observer are seated side by side, and the Vehicle Rapid Fire Weapon System is mounted in a rotating mount behind their position. The weapon is remotely aimed by means of an electronic link to a rotating sight. (C) This vehicle would provide all round protection for the crew against small arms fire at near point blank range. 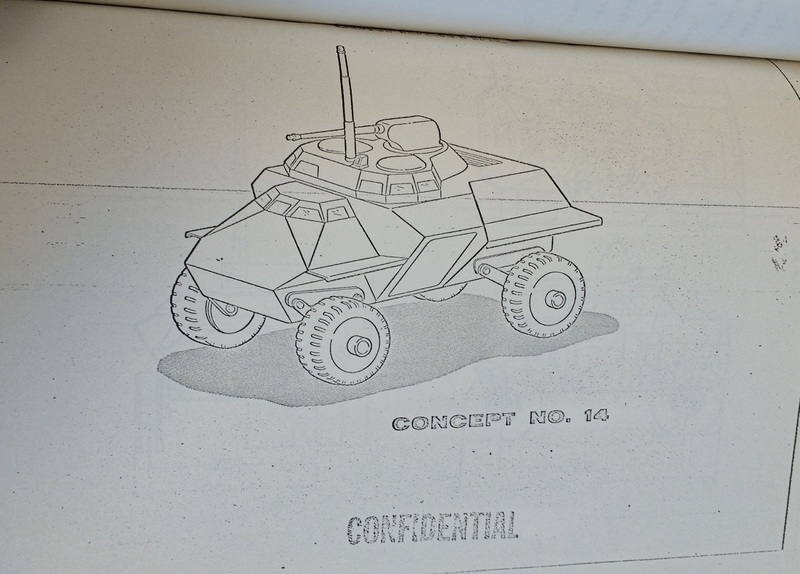 This vehicle is also amphibious and would be equipped with the required surveillance and detection systems that were described in the previous concept. (C) The vehicle weight is approximately 15,000 lbs, and is powered by a reduced noise level, 400 horsepower turbine. The turbine is directly coupled to a high speed alternator which produces the power to drive the electric motor mounted in each wheel. (C) Each wheel is mounted on a jointed two piece arm. A hydraulic cylinder located in the upper arm acts both as a part of the suspension system and also as an actuating device to change the angle between the two members of the arm, thus raising or lowering the wheel with respect to the vehicle. The upper wheel arm is connected to the vehicle trough a rotary suspension system. This rotary system can also be actuated to change the position of the wheel with respect to the vehicle. So the wheel is mounted on an appendage that has essentially a hip joint and a knee joint. (C) It is envisioned that this type of suspension would provide high wheel travel to minimize shock loads due to terrain irregularities, and also provide variable ground clearance to avoid dragging the bottom on high obstacles. Each wheel could be independently controlled to provide a level vehicle for operating on slopes, or when approaching the crest of a hill and preparing to use the extendible periscope. (C) This type of drive and suspension has certain potential advantages in soft soil. In case the vehicle should “Bottom out” in mud, the vehicle could be raised to reduce drag. In the event of continued immobility, or deeper soft soil, the suspension control system could be programmed to permit shifting into a walking mode. This type of suspension capability would also have advantages in crossing obstacles or vertical steps, and would aid considerably in exiting from a river or stream crossing. g. Suspension and drive system that provides both wheeled mode of travel and walking mode. h. Advantages and features listed in previous concept would also be applicable to this vehicle.